The only context in which there are “good” vibrations may be in the Beach Boys’ song. For woodworkers, and in fact, tool users of any kind, there are only “bad” vibrations. Tool vibration can cause discomfort and potential long-term damage (look up Raynaud’s Phenomenon for more information). The human hand and arm is most sensitive to vibration in the 6 to 16 Hz frequency range, and workplace safety guidelines have been established as a function of vibration intensity, frequency and exposure time. Tool vibration can be, and often is, used as a predictor of machine failure and in preventive maintenance. An example would be to measure a perfectly balanced and smooth running machine bearing on a regular basis, noting the change in vibration over time and using that measurement to predict when bearing failure will occur so as to replace the part ahead of time. Vibration can be a source of noise, another work place exposure consideration, and the two measurements are often taken together. Perhaps most importantly for woodworkers, vibration can be a good comparative data source to help us make well-informed purchasing decisions. The simple fact is, for any two similar pieces of equipment, the one with less vibration will usually be the heavier, better-built, smoother running, and more accurate machine. With your hand up in front of your face, move your hand quickly to the right. We will refer to that as positive movement, and the speed with which you move your hand is one measurement and how far you move your hand is another. Then stop moving your hand, reverse direction, and move it back to the left. In this example, that would be the negative movement, and again the speed and distance of movement would be measured. Those movements could be plotted on a graph, with the positive movement above the central line and the negative movement below the line. Now imagine that the movements are plotted for motion in all three axes, left-to-right, up and down, and forward and back. The measurements of these motions would be an aggregate measure of vibration and would be plotted as amplitude waves, much like the waves on an oscilloscope. The combination of all that data is usually expressed as the “root mean square velocity amplitude” or “RMS.” This is a bit of over-simplification, but for machine comparative purposes, it is really all we need to know. We know that sound pressure effects change as the frequency changes, but we are content with understanding the difference between a machine that produces 65 dB of sound and one that produces 75 dB of sound. Likewise, vibration energy changes at different frequencies, as does our response to that vibration energy, but for our purposes, it is sufficient to know that a machine producing 0.45 RMS is vibrating with significantly less force and intensity than one producing an RMS of 1.12 and that a machine producing 7.1 RMS would be considered “unacceptable” by ISO standards. In the real world, day-to-day woodworking world, vibration measurements provided by manufacturers would give us a clear comparative between similar machines. Accessory manufacturers, such as saw blade makers, could provide us with RMS data for their blades on a specific machine type, compared to competitive blades on the same machine. Manufacturers could provide RMS data as a baseline, so that we could monitor our machine’s health and take corrective preventive maintenance steps before damage occurred to the machine. For hand-held equipment, such as sanders, saws, drills, etc., the RMS reading would allow us to gauge long-term operator comfort. I suspect if Festool made the RMS data available for their hand-held sanders, and other manufacturers did the same for their sanders, there would be little more, if any, conversation about the so-called “pricey” Festool equipment. The value and build-quality differential would be clear and unequivocal. 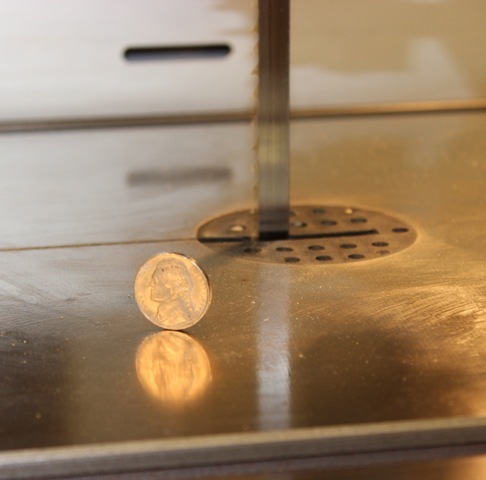 Table saw manufacturers have long “wowed” us with the “nickel test.” A nickel standing on edge on a running table saw is just a way to demonstrate low vibration. Now who will be the first manufacturer to proudly (and bravely) list RMS in their machine specifications?